Everything you need to know about the Class of 2019! All updates and news regarding class of 2019. Running backs James Cook (Miami/Central) and Nayquan Wright (Carol City, Fla.) both picked up verbal offers prior to entering high school from Miami. They are the fourth and fifth known 2019 prospects Miami has verbally offered. Owen Pappoe (Loganville, Ga./Grayson), a 6-foot-1, 190-pound running back, Blake Hinson (Daytona Beach, Fla./Warner Christian Academy), a 6-foot-5, 200-pound tight end and athlete Kenny McIntosh (Fort Lauderdale, Fla./University School) also claim verbal offers from the Hurricanes. 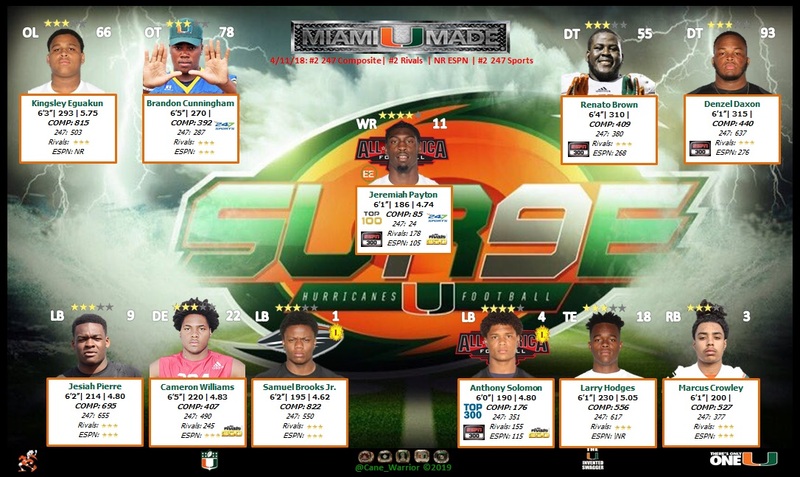 Miami has 20 verbal commits in the 2016 class, six verbal commits in the 2017 class and three verbal commits in the 2018 class. They've yet to take a verbal commit for the 2019 class. A handful of schools have offered 2019 LB King Mwikuta. More to Come. Last fall, King Mwikuta was playing safety for the Lagrange (Ga.) Troup County ninth grade team. He was around 6-foot-1 and 175 pounds. Fast forward nine months and he is now 6-4, 206 pounds with those same long arms and athleticism. He has emerged as a prospect in the 2019 class. After watching him workout Tuesday, Mwikuta is very intriguing. He is athletic and he really hustles and plays hard. He is learning on the fly due to the growth spurt. He was playing defensive back months ago, now he is at outside linebacker, and he could be an edge rusher when all is said and done. He was taking coaching well from the Troup County staff and he showed flashes of what that staff hopes he will become. He has been measured and he has an 82-inch wingspan. He has been compared to recent first round pick Leonard Floyd body wise, but he is still very raw as a prospect. Mwikuta has a lot to like though. The first thing that stood out Tuesday was his competitive nature. He wants to be out there. He wants to learn. He wants to be coached. And he was always playing hard in the Georgia heat. It is a little scary to think what he could be if it all comes together for him. He has to hit the weights and get stronger at the point of attack and continue to learn the position, but he has real upside. He already has offers from Appalachian State, Georgia State, Jacksonville State and Louisville. In this interview, he talks early offers, what those mean to him, what Alabama and Georgia showed him at camp and more. One of the region's top prospects in the 2019 class has Alabama as his leader. Auburn isn't too far behind, though, for LaGrange, Ga., linebacker King Mwikuta. Mwikuta, a 6-foot-4, 220-pound four-star recruit ranked as the country's No. 70 overall recruit and No. 5 outside linebacker, has Alabama on top followed by Georgia, Auburn, Florida State and Clemson in that order, he said Saturday after Auburn's A-Day game. Mwikuta, who aspires a career in radiology, is being recruited to Auburn to play the BUCK position (defensive end/linebacker hybrid). He has made the close trip from LaGrange to Auburn numerous times. "First, their practice (stands out), I can say that," Mwikuta said. "People around, fans, coaches. I can say the culture is good. I always harp on that when I come here. I say the culture is good around here. That's one of the things I look for in a school, the doctoral school. The culture around, you can't have bad culture because that brings bad habits around." But Alabama, a school which offered in January, still leads. Mwikuta has made multiple trips to Tuscaloosa this spring. The buzz is building around Dunbar High School (Fort Myers, Florida) sophomore Derick Hunter, who claims multiple FBS scholarship offers despite limited varsity snaps. Standing 6'5" and 231 pounds, this versatile underclassman landed his first offer from South Florida as a freshman. Florida and Notre Dame have since entered the equation. "I was shocked," Hunter told Bleacher Report while discussing the Fighting Irish offer that arrived earlier this month. Hunter, who moved into starting roles on both sides of the ball this season, is labeled an athlete by Scout.com, and it's probably best not to pigeonhole him to one particular position at this point in his career. He currently lines up at tight end and defensive tackle, but the 16-year-old understands continued physical development may alter his collegiate outlook. "If I end up, like, 6'7" or 6'8", my future might be at offensive tackle," Hunter said. "I'm OK with that. I just want to help the team where I can." While a transition from 231-pound tight end to possible SEC offensive tackle won't occur overnight, he's no stranger to battling inside. "I love to block," Hunter said. "I'm proud of the work I've done in the trenches." Offensive tackle, tight end, defensive end and defensive tackle are each potential landing spots for this emerging Sunshine State standout. Ultimately, he believes the end result is what matter most, regardless of where he competes for snaps on a college campus. "At the end of the day, as long as I make it out from where I'm from, it doesn't matter what position I'm playing—I made it," Hunter said. South Florida seemingly secures an edge in familiarity, as the program has established a presence in his community and extended an offer before any other university. The staff expressed significant interest since spring practice and didn't hesitate to pull the trigger. "It shows they love to recruit this area and there are already a lot of players from here on the team," Hunter said. "Plus, their program is really getting it done on the field right now." The Bulls are 6-1 this season under head coach Willie Taggart but may be hard-pressed to hold off Power Five heavyweights en route to national signing day 2019. While South Florida is enamored with Hunter's potential at tight end, the Gators view him as a defensive line prospect. He plans to return to campus Nov. 12 for the team's game against South Florida. "I'm trying to build a relationship with Florida coaches as fast as I can," Hunter said. "That's a school I'll definitely look at close these next couple years." Notre Dame also appears to be in solid long-term shape here following an Oct. 5 offer. After his initial surprise about the scholarship, reality has set in for Hunter, and the Fighting Irish could be a contender deep into this recruiting cycle. "I've thought about Notre Dame a lot since then and it's a place I'd really consider as, like, a top-five school for me in the future," he said. "The football tradition there is crazy." Head coach Brian Kelly and his staff project Hunter at defensive tackle, providing further indication of how scouts expect him to physically mature. Though he already holds offers from two in-state schools, another has long attracted his attention. Hunter grew up a fan of the Miami Hurricanes. "My dad and I talk about getting that Miami offer a lot. It's a big goal for me," he said. "Hopefully that happens, but right now I'm focused on the offers I have and taking this process day by day." Hurricanes head coach Mark Richt is navigating through his first full recruiting cycle in Coral Gables, and as he continues to sort through Florida natives, expect Hunter's name to come up as a prospect of interest moving ahead. After missing two games with a sprained MCL this season, Hunter is again feeling healthy. He recorded five tackles and opened lanes as a run-blocker during a 41-0 win over Island Coast High School, per MaxPreps, just two days after an offer from Notre Dame took his recruitment to another level. We need to offer this kid!!! ✓ Hurricane Legacy (Nate Brooks). ✓ Wants to be a Cane (LB has eye on becoming a Cane). ✓ Miami Pipeline School (Miami Northwestern). ✓ Miami Speed (4.62 40, 4.2 SH). The debate about his future position, between outside linebacker and defensive end, may be far from over but one thing is sure about Sam Brooks -- he's an athlete. His testing results alone Sunday warranted consideration on Scout's list. He was a top 10 overall Nike Rating performer, checking in at just under 6-foot-2, 200 pounds, logging and impressive 4.62-second 40-yard dash time in the process. But what turns heads more with the edge rusher is a short shuttle time of 4.20 seconds, a top 20 overall time regardless of position. That time would be impressive in any region, even more so in the fertile state of Florida. The Miami Hurricane legacy recruit holds double digit scholarship offers at this time, including Power-5 extensions from Kentucky and Rutgers. Miami Northwestern Pass-Rush Specialist: 19' DE Samuel Brooks Jr. The bulls defense -- has an extremely gifted speed rusher that goes by the name Samuel Brooks Jr., who stands 6-foot-2, 185-pounds, who can flat out run and has the strength to cause havoc within the trenches. The bulls rising star who prefers to be known as the "Edge Hunter", deserves his sports' nickname. The "Edge Hunter" ranked number one amongst all freshman this past fall in South Florida at the highest level of competition (6A-8A classification). This past spring -- at the Miami Nike Combine located at North Miami Athletic Stadium. Brooks Jr., ranked #3 overall amongst all defensive lineman with a rating of a 84.96. The speed rusher showcased his explosion by leaping a 33.6 (Vertical Jump) and recording an electronically-timed, 4.73 40-yard dash. The edge rusher, finished Top 15 in South Florida in quarterback sacks. Brooks Jr., was responsible for 12.5 sacks last fall. He recorded 35 - tackles, 2 - fumble recoveries and 1 - defensive touchdown. On special teams, he also made an impact by blocking 1 - field goal and 2 - punts. Five college football programs (Toledo, UAB, Idaho, Temple, FAU) have already extended early offers to the bulls edge rusher. He has the potential to be a 4-star at worst, all said and done considering his game and athleticism. The bulls could very well add to their NFL Draft picks with this young man. Looks like he is trying to get open for next year.... participated in 3 Openings this year. Not as big as Sit but has a better PB and VJ and faster 40 already. he may grow to be 6'4"-6'5" and should come into college around 215 in 2 years. Surprised that he doesn't have a higher VJ since he plays BBall as well but a good athlete for a QB. Class of 2019 quarterback Taisum Phommachanh is loading up on offers. As schools trickle through Avon (Conn.) Old Farms, the offers are flowing for class of 2019 quarterback Taisun Phommachanh. In the last week, Iowa, Cincinnati, Virginia, Kentucky and Indiana each offered, and Rutgers could extend one Wednesday since Rutgers coach Chris Ash will be at the school. The 6-foot-3 1/2, 186-pound Phommachanh also holds offers from Michigan, Minnesota, Pittsburgh and Syracuse, and now he is trying to figure out a visit schedule. We wont need a kicker or punter. Thoughts?